I had a late lunch today, thanks to a welcome back/congratulations party at the Dance Division at the Library of Performing Arts earlier this morning. I didn’t want to leave, especially since I missed all of my co-workers at LPA, and the German chocolate cake that was served was simply delish! Plus, I did a lot of writing and inventory today to catch up, so I finally was able to stop for lunch at 2 pm. I was weary, and uncertain of finding anything still available and open. However, Don Tapas was my savior today. 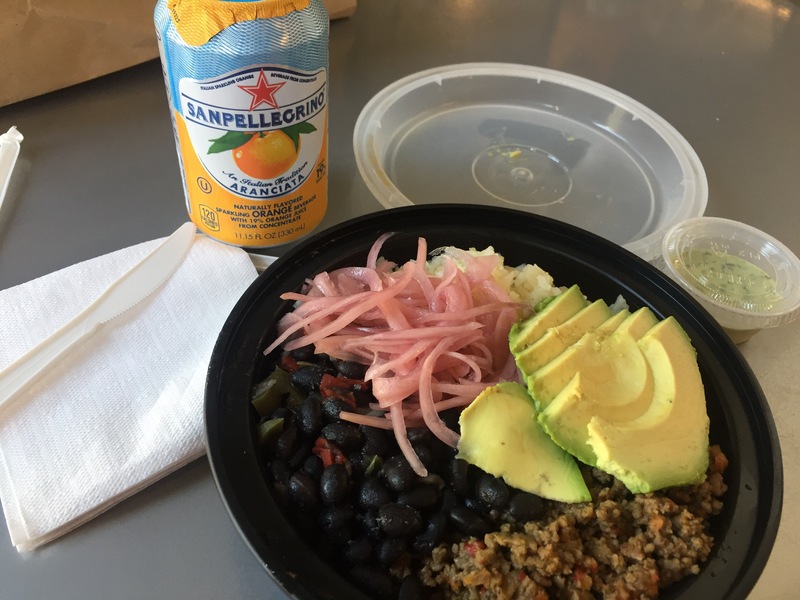 Their daily special is Bululu Bowl: ground beef seasoned with pimentos, pickled red onions, sliced avocado, black beans and sweet plantains, served on Latin white rice, with a side of cilantro aioli. (I ordered mine without the plantains.) I chose San Pellegrino sparkling orange-flavored = Aranciata water to drink with the bowl. Overall, the taste was very good. I recognize the beef from their Sloppy Joes; still a bit too sweet, but the lack of tomato paste did work in its favor this time around. I loved the pickled onions :), and the beans were cooked just right. The avocado? So fresh and creamy! The aioli was, in a word, piquant, especially mixed in with the rice.